I can now go anywhere…. Response Network has of late been having a bit of a challenge in transport, this year it was resolved that a motorbike be bought for administration staff. 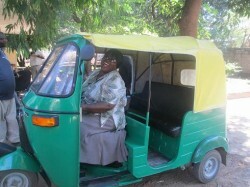 The motorbike has been purchased and all administration staff have been advised to train how to ride the motorbike. Office Manager Frayor, did not show any interest in this development and often keeps quiet when the issue of transport is raised. She has no interest in the motorbike at all. 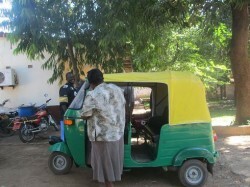 On a busy afternoon we had visitors that came riding in a “Tuku tuku” as it is called in India. Upon seeing it Frayor abandoned her lunch and asked if she could try to ride it. She fitted so well and was really happy and showed alot of interest. She now wants to convince Management to get her one, saying she will go wherever she is asked to go with the “Tukutuku”. 1 comment to I can now go anywhere…. You are right Elizabeth – I have fallen in love with the Tukutuku! And its a-must-have this year!